Eddie Royce is an up-and-coming science fiction writer with a terrible secret: he cheats. He knew he'd get caught, of course. Eventually. But not like this. 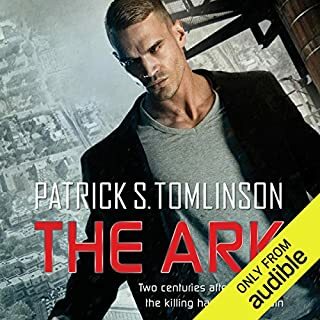 When disaster finally strikes, it strikes big, and Eddie is confronted by the worst person imaginable: his idol, the SF master, Chester Blackwood. To Eddie's great surprise, however, Blackwood has secrets of his own, and instead of outing him, the master storyteller quickly embroils Eddie in a real-life mystery of time travel, beautiful women, and Hollywood gangsters. A modern Robin Hood - minus the part where he gives back to the poor - Webber lays down a few ground rules. No attacking manned ships, and no stealing from anyone who can't afford it. Within months, he and the crew are out of debt. Their next target will make them rich. But the attack goes all wrong. The target's cargo could be the death of them - or it could be the key to reaching the stars. 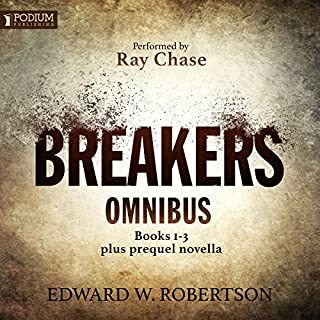 I am a huge Edward W Robertson/Ray Chase fan and this series is one of their finest. If you love "Breakers," this one is for you! While there is no need to experience the first swimmers series, Breakers, it will explain some of the references in this follow-on series, which occurs a millennia in the future. 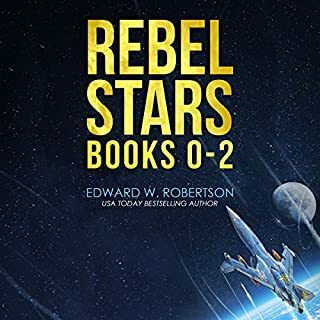 Edward W. Robertson continues to create a wonderful cast of characters along with creative and exciting plot arcs to keep one glued to the story. While there are several lead characters, Webber is the primary one, at least in book 1 and I swear, his mocking and sarcastic attitude along with his luck reminds me so much of Walt in Breakers, I wouldn't at all be surprised to eventually find out that he is decedent of his. The thing is, that while the story plays out in dramatic and often satirical ways, there are moments where Robertson suddenly surprises us with some very poignant and sad occurrences. Ray Chase is a very good narrator and is especially suited for this type of novel but he has a tendency to voice female roles with a gruffer voice than some of the male roles. Even so, he's still a joy to listen to him narrate the story. 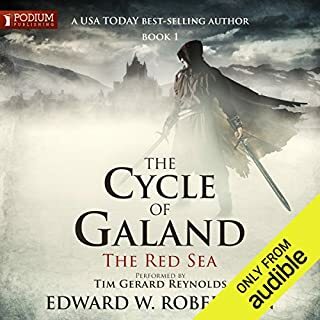 This is a swashbuckling, can't put it down audiobook. 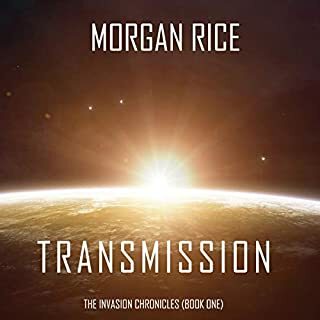 Robertson's prose combined with Ray Chase's interpretation, especially of the aliens, made this hard to stop listening. The characters, especially Rada and Weber, are well developed, thoughtful and complex people. It's always great to encounter a book with a strong female protagonist. I enjoyed this story. it was different. I didn't like the narration. the narrator voice would go up and down making me have to constantly adjust the volume while listening to it in my car. 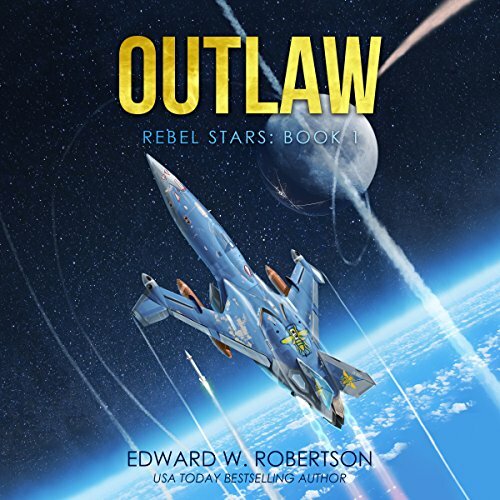 Would you consider the audio edition of Outlaw (Rebel Stars) to be better than the print version? 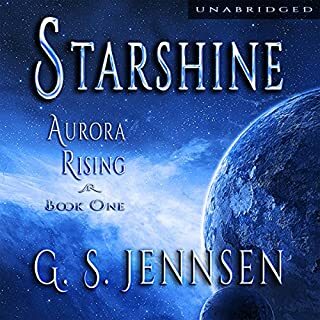 The author takes on the age old battle of crew vrs self and space to make a new life. This time many of the battles are fresh and new, which gives us a new set of feelings for the crew.. The reader, Ray Chase does not narrate teh book, but makes it a living, breathing adventure. He gives depth to the characters and yet an "EXTRA" voice to the story. What was one of the most memorable moments of Outlaw (Rebel Stars)? Trying to survive, fighting off an attacking ship with two broke legs (Which I have experienced two broken legs) made me feel like part of the crew adn the adventure. It became a personal battle I was living. I believe this is the third Ray Chase recording I have and without a doubt the best. He is a classic "friend" to invite over for an evening of story telling. I will from now on seek out new authors based on Ray's aaddition to the role as narrator. "If you are going to cry, do it now and be over it in five minutes." Is a funny line at a moment in time that made it so fitting and poignant.. The adventure is here is far better than I can relate, READ IT and then you can experience the many deep feelings, both laughing and in near tears. An Author I love a narrator I don't. I don't write a ton of reviews but I felt the need for this one. I discovered Edward Robertson from his other series The Cycle of Awran. I love his prose and world building. sadly this series falters not through his fault but the choice of narrator. the reading relies heavily on what I call " the angry whisper" for nearly every character regardless of person or apropriateness. I'll be finishing this one as an ebook. The narration is awful, making the book very hard to understand. There is mostly action in this book, so no real story ever develops. A lot of the main characters die, which I found unusual, and depressing. The plot was very loose. The reader made me think of Vincent Price doing an Edgar Allen movie. This is not a complement. At times zi just wanted to throw the book out, just from listening to him! If you are as fan of Edgar Allen Poe's material, you just might enjoy this novel. What would have made Outlaw better? Would you ever listen to anything by Edward W. Robertson again? If you could play editor, what scene or scenes would you have cut from Outlaw? I don't understand why or how there there is so much really poor sci-fi out there. Is it a genre that just isn't edited or is it just expected to be on a third grade level? I just don't know but SO MUCH of it is really horrible! Once again I feel cheated and am angry with audible reviews for leading me badly astray!! !